Get creative and try a twist on a classic with this roasted tomato bruschetta that’ll become your great go-to appetizer. With fresh roasted tomatoes and a lemony ricotta base, they're as fast to make as they are delicious. In addition to the traditional basil, some fresh mint is also added as a final flourish. Pick up all the fresh produce at your local farmer's market and you will be enjoying an incredible treat in a matter of minutes when you get home. This is certainly a summertime treat! Vegan? Swap out the ricotta cheese for steamed and blended cauliflower. This would also be delicious with roasted stone fruit, like peaches or plums. Per Serving: 225 calories; 8g fat; 31.3g carbohydrates; 9g protein; 6mg cholesterol; 349mg sodium. 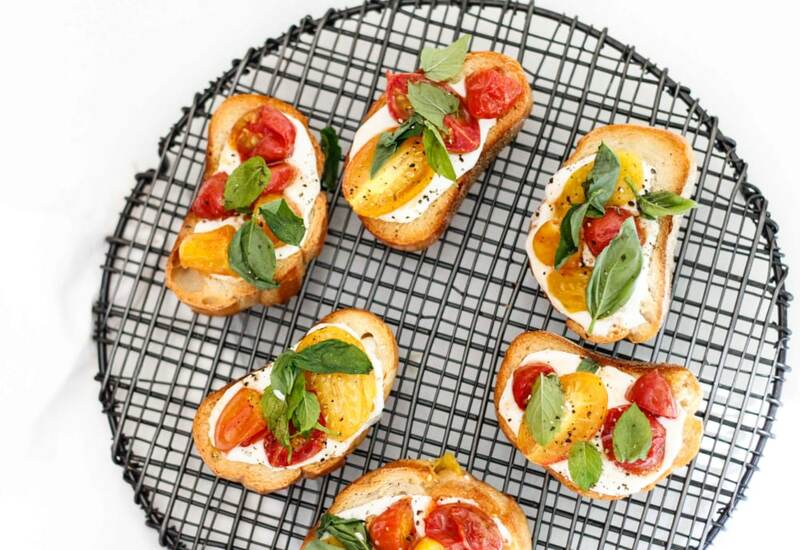 This bruschetta recipe is the perfect dish for summer parties. I've made this with and without the cheese, both are delicious. I love bruschetta! I made this as a happy hour appetizer and served with martinis with my girlfriends. They loved it and were super impressed by how flavorful they were. Winning!